I am teaching a class called "Math for Life" this year. One of the units that we are working on is Statistics. After our many discussions it is time to create our own surveys to gather statistics and then analyze them. This first blog post is about how to go about creating a survey using Google Forms. Here is a sample survey that I created for my classes if you wouldn't mind take a minute or two to fill it out, I would appreciate it. It is a survey on Teen drug use. 1. 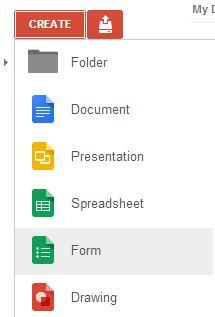 Log in to Google Apps and select your "Drive" option at the top. 2. Click the "Create" button and then select the "Form" option. 3. 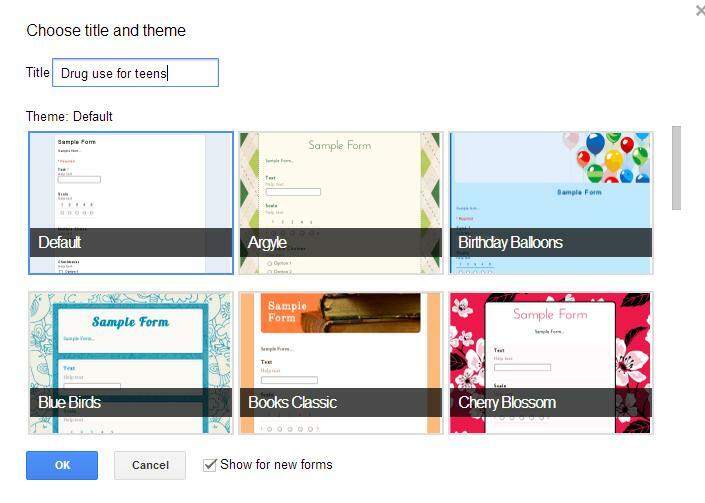 If you haven't used "Google Forms" before then you might get this splash page to appear. Just click the "Get Started" button. 4. Now you will see a window pop open that asks what template you want your form to be in. Just select one that goes with your theme. 5. Give your survey a title and enter a description for it. 6. Now you can start adding your survey questions to your form. The "Question Title" is where you would add your individual questions. I haven't ever used the "Help Text" before, but I am assuming this would be information that would help your respondents know more about the question. 7. There are many question types that you can use for your survey. Just click the "Question Type" drop down box to get a list of questions you can use. 8. The "Text" question type will allow your respondents to type in their individual answers. 9. The "Paragraph Text" type allows users to enter much more information in paragraph form. 10. The "Multiple choice" option gives your survey users the ability to pick from just a couple to several options. Users can only pick one of the choices. 11. The "Checkboxes" question type will allow users to select more than one option from a list of choices. 12. The "Scale" lets you set up a question that can be rated. I haven't had occasion to use this question type but it looks promising if I ever need people to rate something like a product or an activity. 13. The "Grid" type would allow you to create an array of questions. Play with it and see what I mean. This is a great question type to use if you have several answers to just a single question. 14. Once you are done with your question decide whether you want it to be required or not and then click the "Done" button. 15. You can also have "Section" headers and "Page Breaks" as part of your survey. This will allow you to break up a long survey into smaller blocks so that you don't have a continuous run of a page and your users don't have one endless scroll. 16. On your option question types you can also choose "Other" so that your users can respond to a choice that you might not have listed. 17. Now you can reorder your questions by left clicking, hold, and then drag your questions up and down until you get them in an order that is logical. 18. Once you are all done with creating your survey click the "Responses" and make sure the "Accepting responses" option is checked so that people can now respond to your survey. Also from this menu you can view your responses and other options. 19. The last step is to share your form out to the world so that people can start taking your survey. Click the "Send form" button found at the top right corner of your screen. 20. You can easily share to your Google +, facebook, twitter, email, or just copy and paste the "Link to share" somewhere where others can view it such as your blog or website.